Location: East Wemyss, Fife, Scotland. Notes: MacDuff's Castle is a ruined castle near East Wemyss, in Fife, Scotland. The site is associated with the MacDuff Earls of Fife, the most powerful family in Fife in the middle ages, although nothing survives from this period. The present ruins are the remains of the home of the Wemyss family, who lived here from the 14th century, and their successors in the 16th century. It is thought that a castle may have been built here by the MacDuff Mormaers, or Earls, of Fife in the 11th century, at the time of King Macbeth of Scotland (d. 1057). The Wemyss family, descendents of the MacDuffs, owned the property from the 14th century, and built the earliest part of the present castle. Edward I of England paid a visit here in 1304, staying with Sir Michael Wemyss. 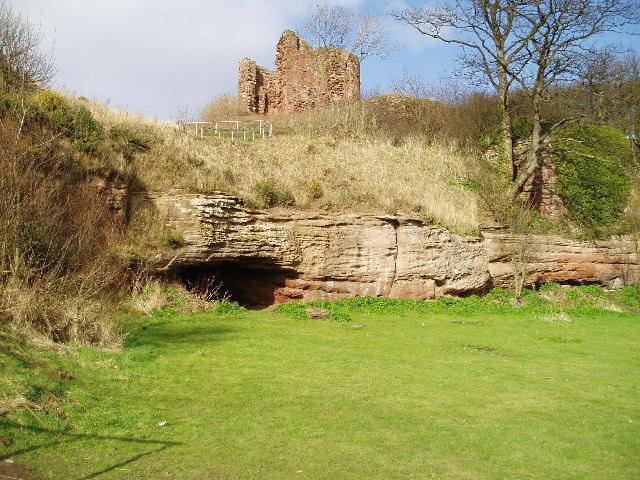 However, Wemyss later joined forces with Robert the Bruce, and Edward ordered the castle to be destroyed. After the Wemyss family moved to nearby Wemyss Castle, it passed to the Livingstones, and then in 1530 it was taken over by the Colvilles who built a second tower to the south-west, and enclosed a courtyard with a gatehouse. In 1637 the castle was bought by Sir John Wemyss of West Wemyss, from Lord Colville of Culross, and in 1651 the lands of East and West Wemyss were united as a single barony.